Vacher, L. ; Marrocchi, Y. ; Villeneuve, J. ; Verdier-Paoletti, M.J. ; Gounelle, M.
Boriskino is a little studied CM2 chondrite composed of millimeter-sized clasts of different lithologies and degrees of alteration. Boriskino thus offers a good opportunity to better understand the preaccretionary alteration history and collisional evolution that took place on the CM parent body. The least altered lithology displays 16O-poor Type 1a calcite and aragonite grains (d18O 30–37‰, d17O 15–18‰ and D17O -2 to 0‰, SMOW) that precipitated early, before the establishment of the petrofabric, from a fluid whose isotopic composition was established by isotopic exchange between a 16O-poor water and 16O-rich anhydrous silicates. In contrast, the more altered lithologies exhibit 16O-rich Type 2a and veins of calcite (d18O 17– 23‰, d17O 6–9‰ and D17O -4 to -1‰, SMOW) that precipitated after establishment of the deformation, from transported 16O-rich fluid in preexisting fractures. From our petrographic and X-ray tomographic results, we propose that the more altered lithologies of Boriskino were subjected to high intensity impact(s) (10–30 GPa) that produced a petrofabric, fractures and chondrule flattening. Taking all our results together, we propose a scenario for the deformation and alteration history of Boriskino, in which the petrographic and isotopic differences between the lithologies are explained by their separate locations into a single CM parent body. Based on the d13C-d18O values of the Boriskino Type 2a calcite (d13C 30–71‰,PDB), we propose an alternative d13C-d18O model where the precipitation of Type 2a calcite can occurred in an open system environment with the escape of 13C-depleted CH4 produced from the reduction of C-bearing species by H2 released during serpentinization or kamacite corrosion. 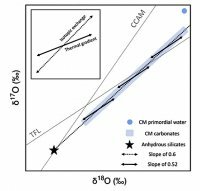 Assuming a mean precipitation temperature of 110 °C, the observed d13C variability in T2a calcite can be reproduced by the escape of 15–50% of dissolved carbon into CH4 by Rayleigh distillation.